Another edition from the "The Weekend Baker" by Abby Dodge. This time we bake cinnamon rolls. Always a favourite in this house, I was curious to see if this recipe could win the boys' approval. No need worrying, it did! This time I followed instructions to roll from the short side. Somehow that always strikes me as odd. Not sure why maybe it's because when I roll the dough the long side is towards me and it is just so easy to start and roll up and away from the counters edge. This got me worried! See how dark the rolls got after the stated oventime? I must say I wasn't paying attention, just set the timer and went on with other things, only alerted by the beep.... Dark gold brown, oops! Feared these were overcooked and -thus- dry. Luckily they weren't dry at all. Next time I will watch them more closely. Prior to ferment, silky soft dough, highly elastic: just right! Punch down, roll out and fill with a mixture of brown sugar, cinnamon and butter. Roll up (from the short side!) and score to cut by using floss thread. Easy peasy and into the pan they went. Lovely recipe, sure to make again. This recipe as well as the other recipes in this book are divided in do-able steps over the course of one, two or even more days; refrigerating or freezing inbetween. So easy! 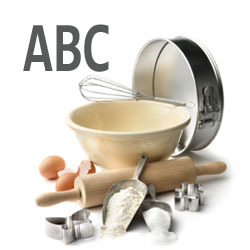 My fellow ABC-bakers have posted links to their recipes here, have a look! Delicious! I don't think they are too brown at all to be honest! Beautiful! The dough was great to work with and so wonderful to smell and look at too! Thanks for visiting my cinnamon rolls, also.